There are two ways to create a replay clip. This is used when you don't know when something is happening, like a goal in ice hockey. Click the Cut button and a clip is created in the list below. The clip contains by default the last 8 seconds. Use mark in/out when you know the start and end points, like an interview. Click Mark in to register the mark in. Click Mark out to register the mark out, and the clip is created in the list below. For clips created with the Cut button two presets is available. 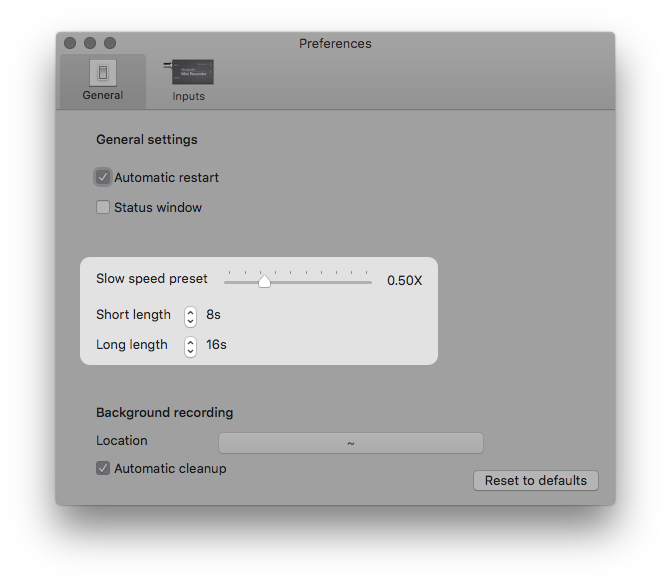 You can change the presets by going to LiveReplayer → Preferences and using the step buttons. Next to each clip you have buttons to extend or move the replay in time. The buttons with the plus signs add 2 seconds to the clip, and the arrows moves the clip 2 seconds. You can also trim manually by clicking the Trim button. Trim the clip using the yellow handles and then hit the Trim button to save. If you have added more than one input the clips is created inside a clip group. The group contains replays from all the inputs when you clicked the Cut button. Double click on the gray group bar where it says "Untitled group". Drag n drop the whole group by holding down the mouse over the group name.